Frank Einstein (A), kid genius scientist and inventor, along with Klink (B), a self-assembled artificial-intelligence entity, and Klank (C), a mostly self-assembled and artificial almost intelligence entity, create an Antimatter Motor using the three states of matter: solid (D), liquid (E), and gas (F), with plans to win the Midville Science Prize. Which all works fine, until Frank’s classmate and archrival T. Edison shows up! Frank Einstein loves figuring out how the world works by creating household contraptions that are part science, part imagination, and definitely unusual. 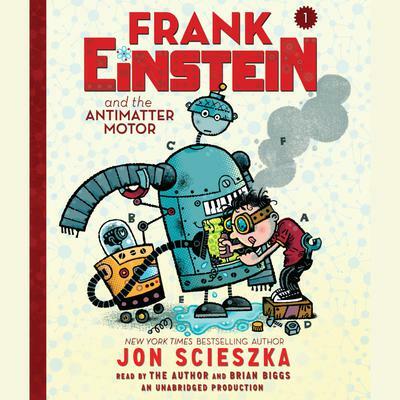 After an uneventful experiment in his garage-lab, a lightning storm and flash of electricity bring Frank’s inventions—the robots Klink and Klank—to life! Not exactly the ideal lab partners, the wisecracking Klink and the overly expressive Klank nonetheless help Frank attempt to perfect his Antimatter Motor . . . until Frank’s archnemesis, T. Edison, steals Klink and Klank for his evil doomsday plan! Using real science, Jon Scieszka has created a unique world of adventure and science fiction—an irresistible chemical reaction for middle-grade listeners. Please invent time machine. Send your books back in time to me in 1978.